We introduced these superhero capes to our pre-school children to enhance their ongoing interest in Superman, Batman and Spider-Man play. Our pre-school team often raise the issue of how to approach this kind of imaginative play without it becoming overly aggressive, so the arrival of this resource stimulated fresh thought on how to support this. We started with the children to gain their thoughts and ideas. We asked questions such as “What is a superhero?” And “What do they do?” This allowed us to develop thinking surrounding the nature of this theme beyond play fighting alone. We also made sure we involved both the girls and boys fully to ensure this play would be equally accessible to both genders. Thoughts progressed from seeing the role of superheroes as “getting the baddies” to “helping people”. Superheroes are not only strong and brave but they are also kind, caring and helpful. After researching this area, we provided a box of superhero props to extend imaginative play ideas. This included phones, torches, magnifying glasses, binoculars, pens, pencils and notebooks. The direction of the play turned towards search and rescue scenarios, with children making maps to locate mysterious dens and caves where characters could be hiding out. This naturally progressed to den building outdoors which gave a different dimension of problem solving to their role play possibilities. To extend this play further, pre-school could engage in more large scale collaborative construction to create different forms of transport for superheroes to travel on. Communication and language can be developed through looking at different pictures of superheroes and talking about their features and super powers and which of these characters is their favourite and why. 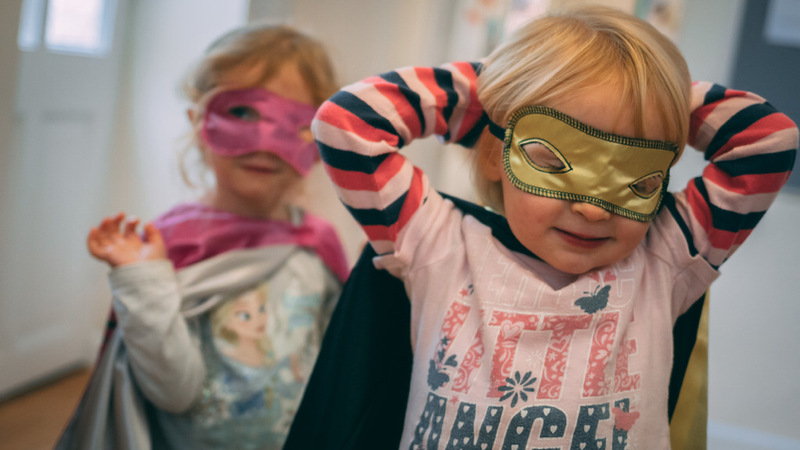 Creative activities can be encouraged through designing their own superhero, even making their own props and costumes. The whole nursery could hold a "dress as a superhero" day. The benefits of this kind of pretend play allow children to practise communicating their emotions in a dramatic play context. Behaviour boundaries can also be explored through this theme, such as, what we can and can’t do, and being part of a group, leading to greater understanding and empathy towards others. Involving members of the local community such as fire fighters, police officers and nurses will engage the children in understanding that the people who help us actually can save lives and are the real life superheroes.